Katrina Kaif turned a year older on 16th July 2018 and her co-star Shah Rukh Khan took to Social media and shared a picture of the actress from their upcoming movie “Zero”. The 35 year old actress will be sharing screen space with Shah Rukh Khan and Anushka Sharma in the science fiction film “Zero”. The film is directed by Anand L. Rai and written by Himanshu Sharma. It is jointly produced by Gauri Khan and Anand L. Rai. The plot of "Zero" revolves around a man with dwarfism portrayed by Shah Rukh khan, who falls in love with a superstar. In the film, Katrina plays the role of a superstar and Anushka is the girl with intellectual disability. 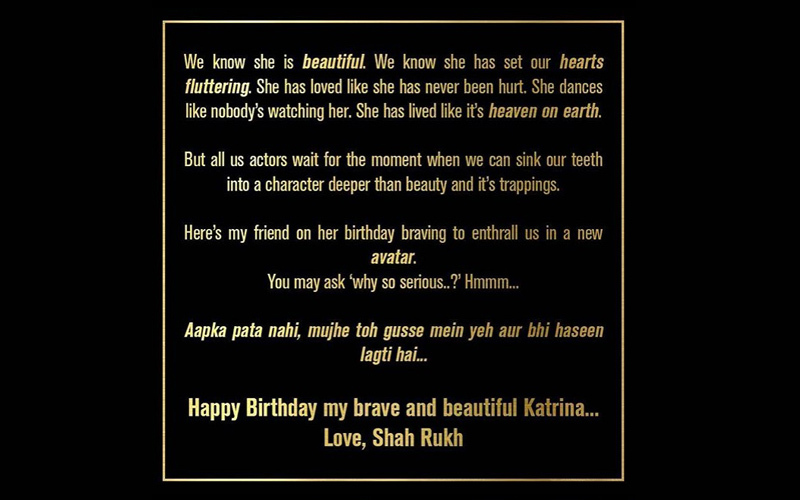 On the special occasion of Katrina’s birthday, Shah Rukh Khan shared Katrina’s first look from the film along with a sweet note and captioned it, “There are so many lovely pictures of her, but this one speaks to me beyond my friends beauty....hope u all also give it love”. “Zero” is slated to release on 21st December 2018.